Diurnally active in the Kerio Valley, Kenya. Dec. 2015. Length about 7 mm. 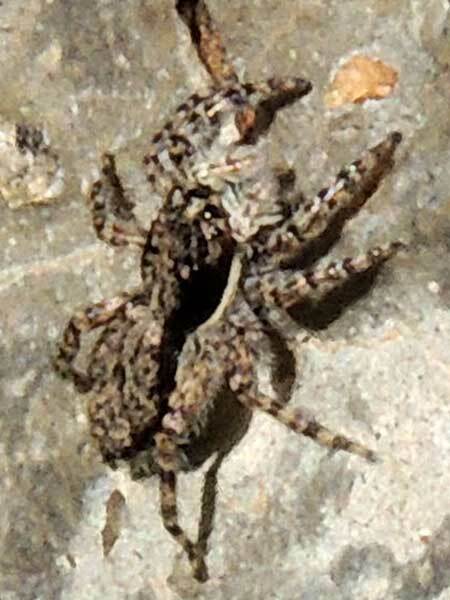 Salticids hide at night because they are creatures of day, when they can make maximum use of their advanced visual system. Once they spot a suitable prey insect they stealthily advance and then leap upon it with great precision from a considerable distance. The spider at right is a male and was probably out looking for a mating opportunity. It has special markings on its boxing glove palps designed to signal a female that he is not to be considered a prey item.